These are the products I use on a daily basis for over a year now, if I don't have time to play around with makeup and need something that is quick and easy before I have to head out the door. I rarely use a primer and that's something I definitely need to start using. So for my base I just go straight in with the Nars Sheer Glow Foundation in the palest shade which is Siberia. I like applying this with a Real Techniques Sponge because I find it best with my dry skin. 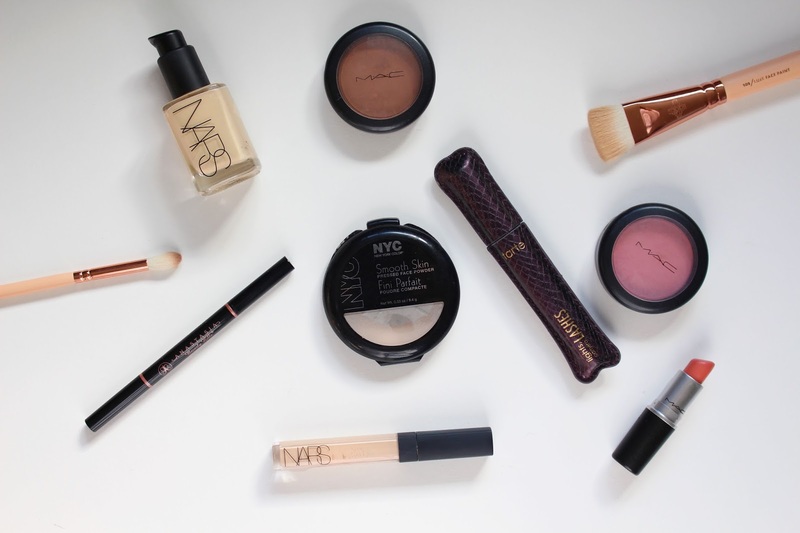 For blemishes and under my eyes I use the Nars Radiant Creamy Concealer. I mostly use this because it's the palest concealer I have found. It doesn't work too great if you have dry patches as it clings but until I find something of a similar shade that works for me, it will do! To set my under eyes I just press in a bit of NYC Smooth Skin Powder which is really cheap but works so well. Lastly for the eyes I give my lashes a couple of coats of the Tarte Lights Camera Lashes Mascara which I picked up on my trip to New York last summer and I've been really liking it but it's sadly on its way out now. I was so sad when my Brow Wiz finished a couple of weeks ago so I decided I would try out the new Anastasia Brow Definer which so far I have been loving! I wont talk about it too much as I'm planning to do a full post on it soon! To finish off I like to bronze/contour with the MAC Blush in Harmony and then MAC Blush in Well Dressed to add some colour to the cheeks. What products do you use everyday without fail? It's a good post. Thank you for sharing this with us.